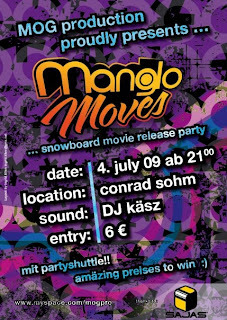 Joralulu's finest Sebi Geiger is featured in the new mog productions realese "Manglo Moves" Get the DVD now with the playboard mag (www.playboard.de). The movie is really dope and Sebi has got the opener... expect some mad trickery as he totally slays everything in his part! Also the first premieres are going down and the Joralulu party team went to the Landeck and Ibk premieres, check out this article http://www.methodmag.com/node/5347. Next stop is the Conrad Sohm! The legendary DJ Käsz is gonna spin the finest records, so you better be there!